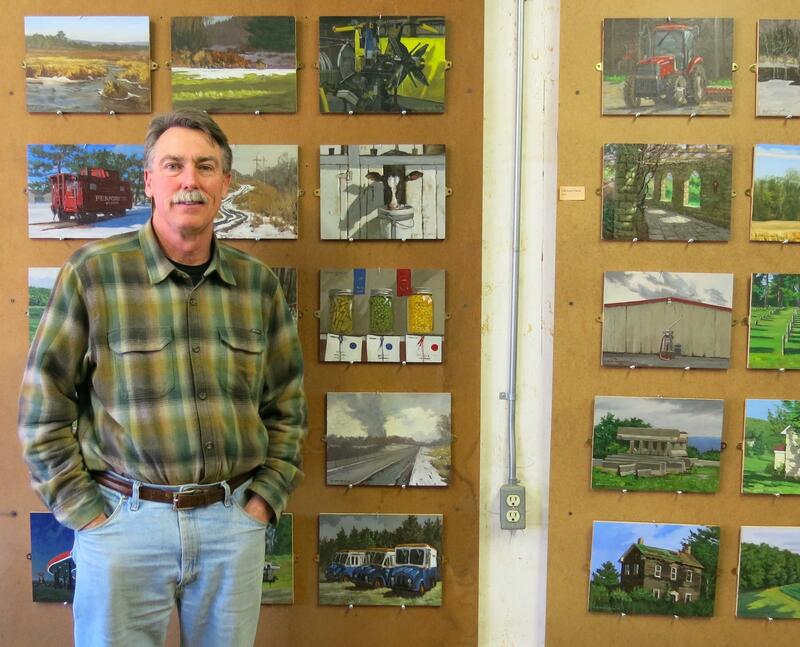 Pittsburgh landscape artists Ron Donoughe, beside some of the paintings he's done of Cambria County, where he grew up. 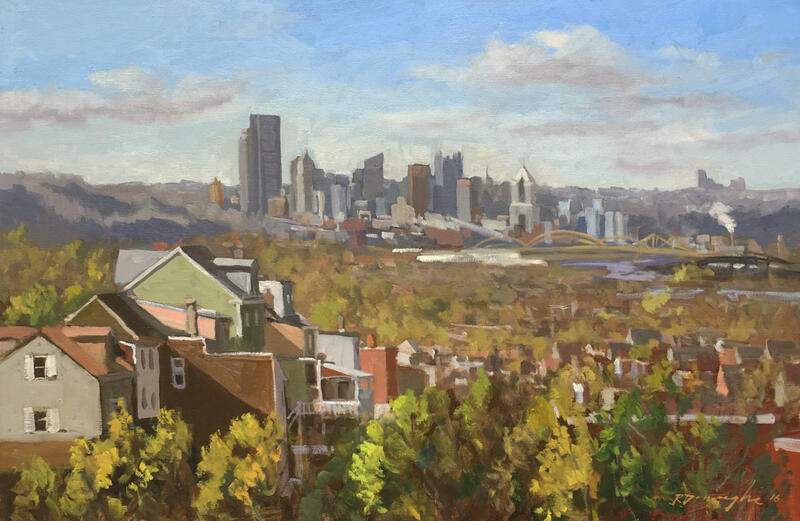 Pittsburgh Artist Ron Donoughe has captured the city’s neighborhoods one brush stroke at a time. 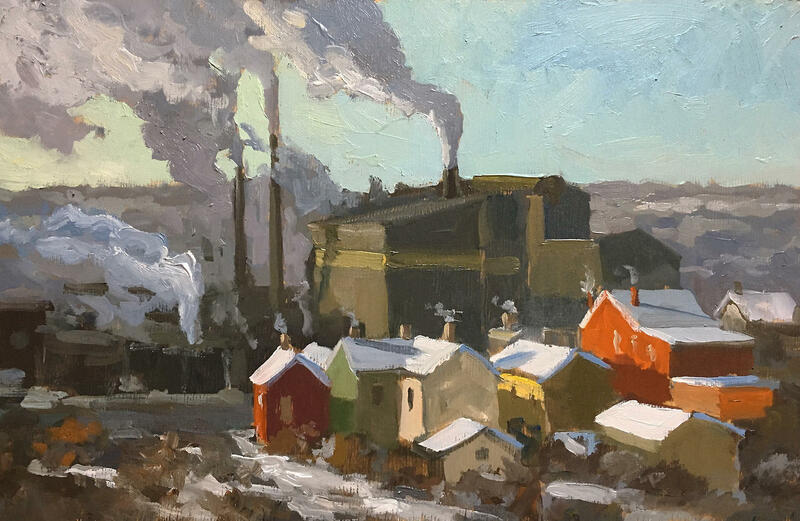 The plein air painter has visited each neighborhood, paintbrush in hand, in front of an easel and canvas for his 90 neighborhoods series, now on display at the Heinz History Center. 90.5 WESA’s Deanna Garcia recently spoke with Donoughe at his studio in Lawrenceville. DEANNA GARCIA: Where did you learn to do this and how has your craft grown over the years? RON DONOUGHE: Even though I had a degree in art education, I really consider myself fairly self-taught. I worked at museums with curators and registrars and art historians, I studied a lot of artists, I’ve taken workshops with other painters, I did attend the California College of Arts and Crafts in Oakland, California for a while. I think I’ve finally found my voice after about 25 years. My skills are better and I’m more proficient, I can see the painting in my mind’s eye before I start it and I’m able to create it. GARCIA: Tell me about that process, from the time you identify it and visualize it in your mind. DONOUGHE: Well, as a painter, when my eyes are open, I’m actually painting in a way. I’m looking for possible subjects or lighting situations. I think driving is OK, but it’s better to be walking, you really feel the light and atmosphere and the possibilities from being directly confronted with your subject. I have my paints with me at all times and it’s not uncommon for me just to pull off and make a small sketch that later may become a larger painting. GARCIA: Take me to when you’re doing one of these paintings, when you’re out in the open in a neighborhood -- what are you thinking? What are you doing? DONOUGHE: I’m always nervous to start off. You know, people think painting is fun. I would say I enjoy what I do, but it’s not fun. It’s, in some ways, stressful. I’m confronted with, "Can I make a decent painting here? Am I gonna be approached by strangers? Am I in their parking space?" There’s a lot of miscellaneous things, but I usually get my gear out pretty quickly and put it on the sidewalk and get set up because I know I’m being watched. I will get something started within 10 minutes without walking around, looking too suspicious. At that point, it’s not uncommon to scrape it off, start again. I would say I need two to three hours on a site because after that the light and shadows have changed so drastically that I would have to start a different painting. 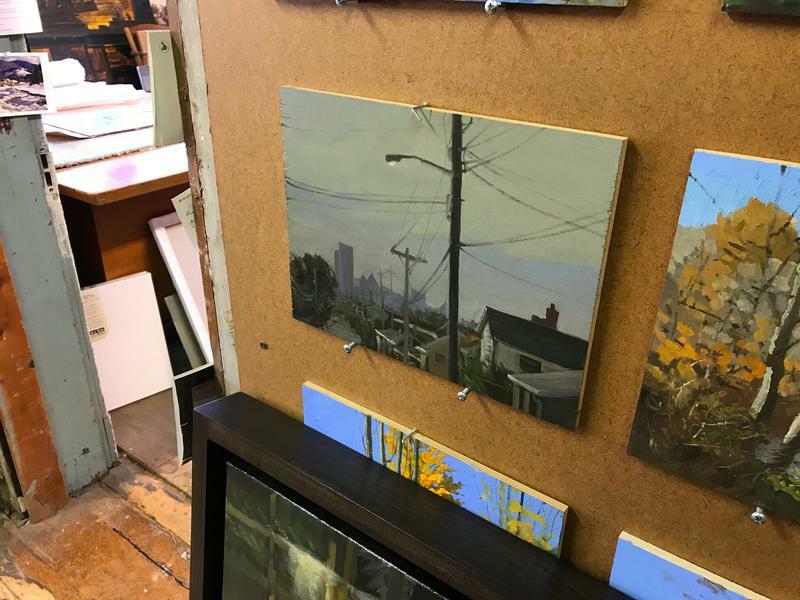 GARCIA: What are some interesting aspects to painting Pittsburgh? DONOUGHE: It feels like the history is in front of us everywhere we look and we’re really lucky here because we have this amazing geography. So, wherever I am there’s layers of Pittsburgh you can see, like the downtown buildings sticking up from the West End or Carrick. It just seems so interesting and still gnarly enough that I’m intrigued by that. I’m not painting a postcard, but I’m trying to get at the deeper meaning of why Pittsburgh is interesting. GARCIA: Going outside of Pittsburgh, where else have you painted? DONOUGHE: I have two worlds that I paint. One is Pittsburgh and the other is Cambria County where I grew up and went to the county fairs and factories. 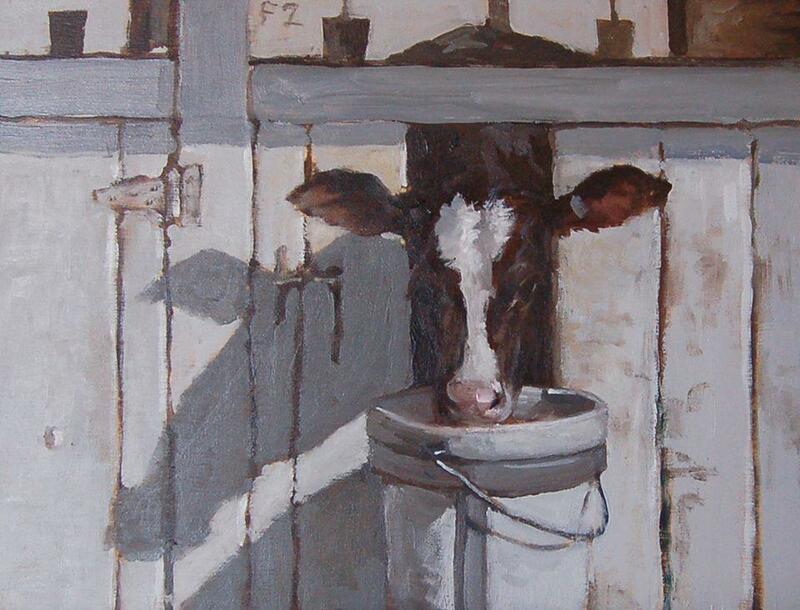 I’ve painted everything from gas stations to the calves on the farm. I really just wanted to dig deeper and deeper about what it was and kind of make a connection with my history through my paintings. I think it’s a really interesting contrast. I find being in the country for a few days is a nice contrast to me painting in the city. GARCIA: What keeps you going? DONOUGHE: I Just love it. I feel like I’m born to do this and there’s nothing else I’d rather do every day. I almost leap out of bed to get to my studio and to get out to work sometimes because everyday I think, and it might sound corny but,"It might be the day I create a masterpiece." I don’t know, and it might be the day that I scrape off everything I do. I don’t know, there’s just the possibility. I love catching the moment of a day and recording that day – it’s the world that I live in – my lifetime in paintings. 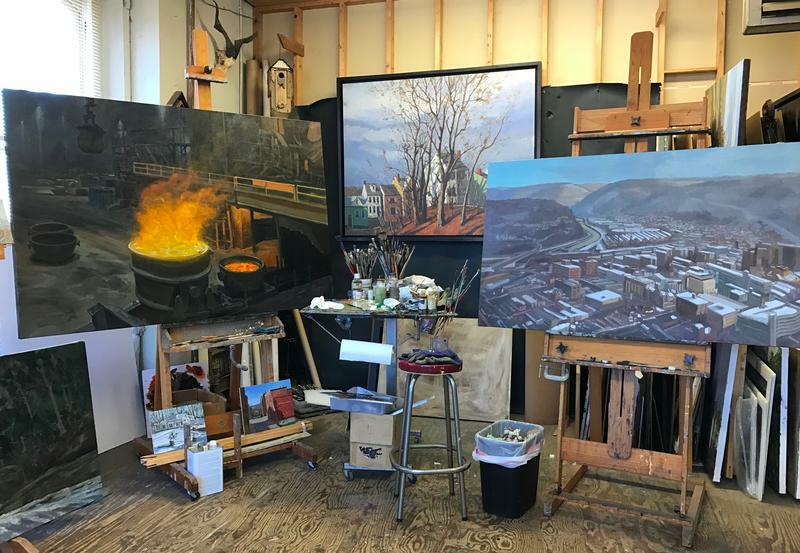 Donoughe will talk about his 90 Neighborhoods exhibit and book at the Heinz History Center April 26 and his paintings from Cambria County will be on display at the Southern Alleghenies Museum of Art in Loretto, April 21. As Pittsburgh neighborhoods, like Lawrenceville, undergo revitalization, art can often reflect changes. Furniture designer Joe Kelly has been there since the beginning. Kelly spent a lot of time investing in the changes that helped make Lawrenceville one of the city’s most popular – and valuable – neighborhoods. Kelly said he and other industrial artists in the neighborhood joined forces to boost neighborhood appeal. Teresa Martuccio, 36, has worked with adults with cognitive and developmental disabilities for more than a decade. 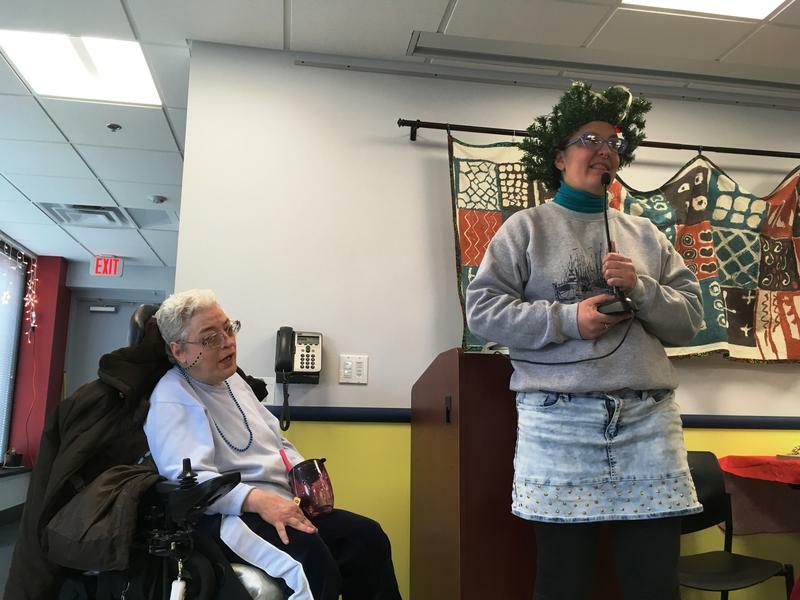 For the last several years, she taught art at Community Living and Support Services, also known as CLASS, in Regent Square. 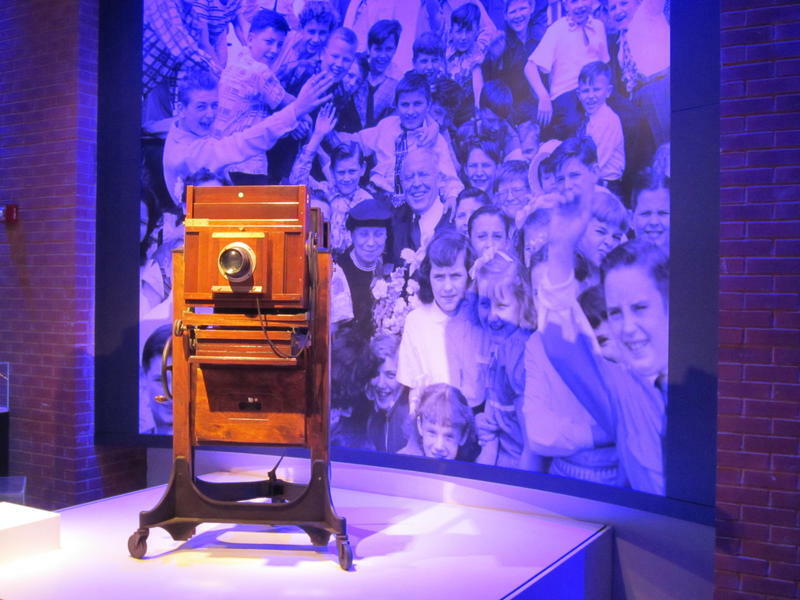 Imagine pouring over images in a prized family photo album. But it's not just your family; it's every family to live in Pittsburgh for 12 decades.